Relegated Clyde have chosen Ross County chief scout Stuart Millar as their new head coach. Former East Stirlingshire manager Gordon Wylde will be first-team coach and is promoted from his position in charge of the under-19 side. Both men turned out for Clyde during their playing careers. Millar will join the Cumbernauld club, who have dropped to Division Three, after County's appearance in the Scottish Cup final. The 44-year-old, a year younger than Wylde, was formerly assistant manager at Stranraer under Neil Watt, who is now Clyde's director of football. Watt has been caretaker boss since the sacking of John McCormack and will continue offering advice to the new head coach. "Clyde supporters will know the two names," the former Ayr United and Stranraer manager told BBC Scotland. 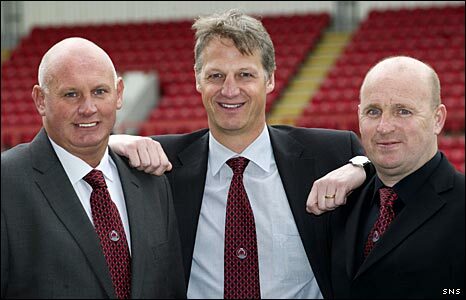 "They have both played at Clyde in the past and had good careers at senior level and they have both had a huge degree of experience in coaching and management themselves in the lower leagues up to the First Division. "They bring a lot of experience to the club and they bring different attributes that can complement what is here already." Clyde also plan to fill a new position of chief scout in the near future, with the decision not to appoint a manager being the result of a review of the Second Division club's activities launched by Watt before McCormack's departure. Watt said it was a reaction to "this idea of the manager being given a budget and squad of players and left to get on with it and, if he does well, he gets all the plaudits, if he does not do well, he gets all the stick that goes with it then eventually the sack. "There are some frightening statistics out there as to how few managers progress in the game - 59% of managers in English football at the end of their first job never return to the game. "What we are doing in Scotland, in particular, is that we are breeding a nation of coaches and being very remiss on breeding managers. There are just not many young managers out there. "What we are trying to introduce at Clyde is a more robust, longer-term structure where people can fit in and get more background support from people like myself." Clyde themselves have already sacked two managers this season on the way to their second relegation in succession, McCormack having succeeded John Brown in November. Now a club that not long ago came runners-up in Division One will be playing in the bottom rung of the senior game next term. "The background to this is that the club still has a mountain of debt and people talk of the heydays, when they five or 10 minutes away from SPL football, which is true," said Watt, who admitted Clyde remained in the middle of a financial crisis. "But, if you look back at the facts of that, that was built on a dream based on not looking after the housekeeping properly by paying players in place of what they should have been paying in terms of paying others and for the stadium. "Yes, Clyde nearly reached the SPL, but that was never going to last. It was all going to come tumbling down at some point. "What Clyde are suffering is really a backlash from what went on three, four or five years ago, so we are trying to rebuild the situation so that doesn't happen again."